All this week, I’ve been posting about DUY Upcycling projects that my husband, Marc, and I have worked on in his home music studio. So far, I’ve shown you how we turned a cabinet door into a shelf, repurposed upper kitchen cabinets into a compact, organizational workspace, and organized small guitar parts with recycled glass jars. Todays project was one Marc did on a whim, and it’s so easy I can explain it in 3 steps and one photo. Step One: Grab an old, discarded wooden shelf or other finished piece of wood. Step Two: Apply pre-cut adhesive strips of Velcro to both the board and your guitar pedals; evenly spacing the velcro strips across the board. 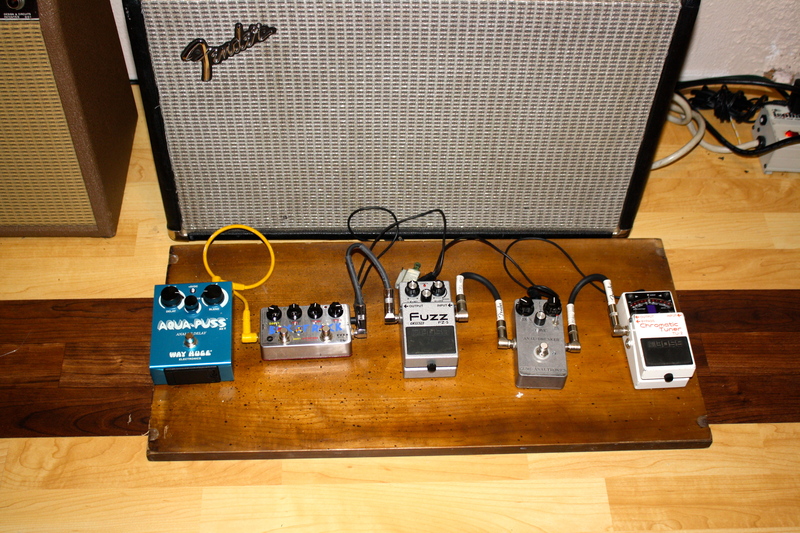 If some of your pedals are wider, you may wish to place one or two pieces off center. Step Three: Stick pedals to board. Add cables, amp, guitar and jam! This streamlined, simple board blends in with the decor of the room and keeps everything orderly, which is so important when working in a small space! Join me tomorrow for the end of DIY week, I’ll explain how we came into the fun, striped floor in this room.